ALL OF THE DREAMERS PREMIERE! We're very excited at the thought of our new single ALL OF THE DREAMERS premiering this morning! Listen out to breakfast radio tomorrow to hear it first, or visit our Myspace page from 9am. All you need to do is SMS your name and email to 1999 44 87 to pre-order "ALL OF THE DREAMERS" and go in the draw to win! SMS cost $2 including GST. * You'll receive your single on October 16th. 5th Finger Pty Ltd. Terms and Conditions are available here. 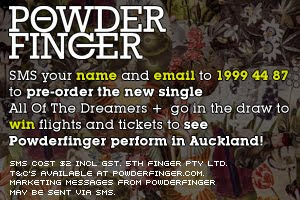 Marketing messages from Powderfinger may be sent via SMS. We're very excited that you'll finally hear ALL OF THE DREAMERS very shortly, and we hope you love it as much as we do! Written at 7:54 AM by powderfinger. Is the single out for release in the UK? Do you have a uk release date for the album yet ? ?